As a science teacher, few things beat a high-quality scientific explanation from a student. However, the frequency of such explanations often seems far and few between. Yet year after year, I grade hundreds of lab reports and short answer questions only to consistently feel like I’m sitting at a slot machine experiencing a bunch of “near misses”, several “not-even-close calls”, and just a few “jackpots”. So how can we, as teachers, develop our students’ ability to consistently create better scientific explanations and arguments? For me, the first step toward teaching my students how to critically think about how they structured an argument or explanation was to implement the Claim, Evidence, Reasoning (CER) framework. While the premise behind CER isn’t anything new to the way science teachers already think, it provides an entirely different approach toward how students connect their experiences and previously learned content into something that is much more reflective of being scientifically literate. Though you may have already guessed from the name itself, applying the CER framework to an explanation or argument goes something like this1. It answers, what can you conclude? It should not start with yes or no. It should describe the relationship between dependent and independent variables. Sufficient—Use enough evidence to support the claim. Appropriate—Use data that support your claim. Leave out information that doesn’t support the claim. Qualitative, Quantitative, or a combination of both. Shows how or why the data count as evidence to support the claim. Provides the justification for why this evidence is important to this claim. Includes one or more scientific principles that are important to the claim and evidence. A more thorough summary of the CER framework can be seen below in a nice 7-minute video created by Paul Anderson of Bozeman Science2. You can also read more about the CER framework from Activate Learning. I encourage you to download their CER poster for your classroom. Though you will experience your own journey upon implementation, I wanted to offer a few of my own thoughts and experiences that answer some of the primary questions I had before starting to interweave this framework into my curriculum. #1 - How do I introduce this to my students? By the time students reach us in their late high school or early college career, they would have already had 2-3 years of science classes. While you can be reasonably certain that they had been exposed to writing conclusions, or providing short answer explanations to conceptual questions, it’s likely that they had never been explicitly taught the merits of a quality explanation or given intentional practice to work on this skill. Because of this, I recommend introducing the CER framework in a non-scientific context so that students can more easily pick up on the anatomy of a good explanation with the intention that they will eventually be able to transfer these new thinking patterns to a scientific context later. Though there are hundreds of fun ways to do this, here is one way I have introduced CER the past couple years. Watch the video and take a look! I discovered this commercial while reading Trevor Register's blog post about his CER implementation experience. The little girl in the video believes her dad is an alien and provides multiple pieces of evidence as to why she believes this to be true. Not only is it cute and humorous, but everything she mentions inadvertently provides an awesome opportunity for students to do three things that are fundamentally important when introducing CER. Examine each piece of evidence mentioned and determine if it supports the claim or not. Upon examining the evidence, students have an opportunity to critically think about why each piece of evidence justifies her claim. In other words, why would “speaking a weird language” or “drinking green stuff” justify the claim that her dad is an alien? That part is pretty fun to talk about with students. It gives them an opportunity to hear an inaccurate explanation that sounds like an accurate one. No matter how adorable the little girl is, we can safely agree that her lack of experience on this Earth has allowed her to make connections between her evidence and claim that simply are not true. To the girl, her argument sounds completely valid. But to the rest of us, we are able to quickly discount each piece of evidence provided simply because we have more experience and knowledge than the little girl does. Though students may laugh for the moment and reminisce about how fun it was to be little, the humorous thing is that many of them will actually end up doing the same thing this little girls did early on with their evidence for chemistry explanations—to which I am quickly able to discount! I will typically ask for students to construct their own CER first and then get into small groups to discuss the merits and any potential holes in each argument. It takes a bit more facilitation by me to get them to realize the point of inaccurate reasoning beyond the simple example of the little girl but students quickly pick up on the message I am trying to get across. The process is fun and, most importantly, meaningful. It truly does provide an easy way to introduce a more complex way of thinking about how we explain things in science. As students start to gradually improve their CER skills, teachers should work in relatively easy science examples like Francesco Redi’s famous investigation of spontaneous generation. My own use of this example can be found in the supporting information at the bottom of this post. #2 - Is this only for lab reports or can I use this for homework, quizzes, tests, presentations, etc. too? The answer to this can be whatever you want it to be. During my 1st year of implementation, I only used CER in the lab setting. I regret that decision because the nature of our content provides opportunities for students to practice and reflect on their scientific explanations pretty much daily. Adhering only to the lab setting may allow students to think that somehow their explanations of findings in the lab have a fundamentally different structure than the answers I ask them to provide on an assessment. This year, for the first time, I have started to incorporate CER into my quizzes, tests, labs, and homework. 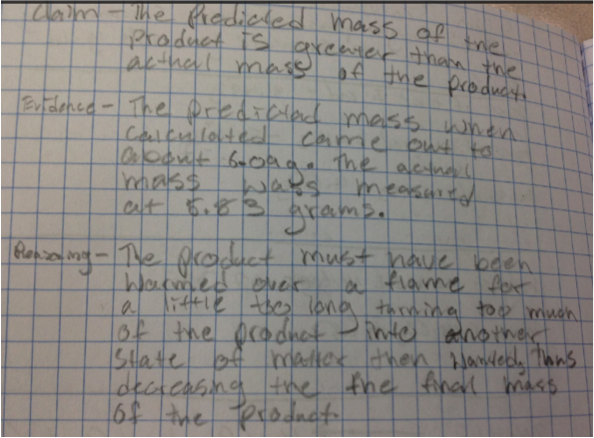 #3 - What are some chemistry examples of student work? Here are a few that I grabbed from a variety of activities we have done throughout the year. 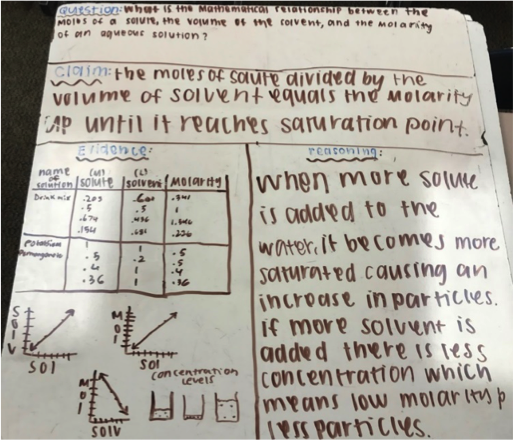 Several more good/bad student examples from this lab can be found in the supporting information at the bottom of this post. Claim: One source of error that affected our percent yield was our filter not being closed enough when in the funnel. Evidence: The water coming out of the filter was not 100% clear and had some cloudiness to it. Reasoning: If the water was not clear that meant that some of the precipitate was flowing out in the water and went down the drain and didn't make it into the final mass of the solid Pb(OH)2. #4 - How do I grade CER assignments? The most efficient and accurate method I can suggest is to create a uniform rubric that will be used for every CER explanation. Though the explanations will differ based on content, the general structure to them will always be the same. You can find CER grading rubrics on the internet but it is not difficult to create your own once you understand what each piece of the framework looks like when done properly. Here is a relatively simple one that I have been using throughout the year. #5 - How do I convince my colleagues to try this with me? Do you want your students to become better at constructing evidence-based explanations and arguments? If the answer to this is yes and you have a potential framework to offer that can accomplish such a task, aligns with what the NGSS standards advocate for, and already has enough of a foundation in the scientific education community to be taken seriously, then it will leave them with little room to comfortably say no. If time is the immediate obstacle, then you will find a way to rethink how you spend time currently and make the appropriate modifications. I am proud and thankful to be part of a chemistry department that was willing to accept the integration of CER. Doing so has allowed us to share, compare, and reflect on student work in ways that we rarely would have ever done in the past. If you decide to do this as a team of teachers, I strongly encourage you to make sure that everyone is on the same page about what CER is, what it looks like, and even how you all plan to grade it. Honestly, it took us months before we realized that maybe it would be a good idea to do something like individually grade a student’s CER example to compare grading and discuss our reasoning. Doing a simple exercise like this quickly made us quickly realize that we were not all on the same page about what we defined as “high quality”. This exercise helped us to constructively argue and become more aligned with each other. Even if you are just the lone wolf using CER, at least you can be confident that you are intentionally trying to make a difference in building a skill that will help students well beyond their academic career even if it is outside of the scientific context. #6 - How much time does this take to produce meaningful results? I can honestly say that consistently and effectively implementing this was (and still is) a process that simply takes time. It is not something subtle like introducing daily warm up questions, exit slips, or new ways of giving formative assessments. It really is a classroom cultural shift with respect to how students interact with their thinking and, because of that, it takes time. The time it takes to produce the results you want largely depends upon your commitment to providing frequent exposure, giving feedback, offering “re-dos”, and consistently communicating the characteristics of a quality scientific explanation. Though I have only been using the CER framework for the past 2 years, it has caused me to completely rethink the expectations I have for lab conclusions, short answer explanations, and argument building. This approach has adhered to our classroom culture enough that it's even gotten to the point where my own students find ways to vindictively use the framework against me when trying make the case for the Dallas Cowboys being the best team in the NFL or whether they should been given a test next Friday! As far as I'm concerned, the more scenarios I can get them to say "what evidence do you have for this?" then I am helping build a skill that will act as a useful filter for the truth in a world of constant information exposure. I am glad I was introduced to CER and I continue to look for better ways to implement it. If this sounds like something you are interested in, I recommend just trying it out for a while and see the kind of results you get from your students. I have found that more of my students are now writing high-quality scientific explanations. That is an area I have wanted to see improvement in since I began teaching! Feel free to share any experiences you have had with CER or anything related to evidence-based explanations. 1 "Claim Evidence Reasoning CER | Activate Learning — Activate ...." http://www.activatelearning.com/claim-evidence-reasoning/. Accessed 10 Feb. 2017. 2 "CER - Claim Evidence Reasoning - YouTube." 9 Jan. 2017, https://www.youtube.com/watch?v=5KKsLuRPsvU. Accessed 10 Feb. 2017. 3 "Audi "My Dad's a Space Alien" - YouTube." 25 Sep. 2012, https://www.youtube.com/watch?v=sVRAtQ7XjkM. Accessed 10 Feb. 2017. Just tried it last week: I love it! Based on our previous Twitter conversation, I tried it in January for a lab - but I had to be absent for the "Board Meetings" from the lab groups. So I didn't get as much of a handle on it. But just last week I tried it again for a "data management" activity where I gave students a question (related to enthalpy of hydration) and asked them to follow the CER Framework for their analysis and discussion. I'm putting together my blog post on this now. I've benefited from the focus on targeted evidence and better reasoning - and think my students have as well. I don't have direct evidence yet, but anecdotally it seems to be the case. Great post! Thank you for the student samples! My district in Georgia is encouraging elementary, middle and high school teachers to implement CER as often as possible with our students. The vertical teaming approach will hopefully build outstanding explanation skills in our students which will reach a pinnacle at high school. Right now, it is painful. The current students have no experience, and the teachers have no training. I'll definitely be sending my professional learning team to your post! Our students NEED samples to understand the end product. The vertical approach sounds like a great idea. If done appropriately, I can only imagine the benefits you would see by the time those younger students reach high school. I'm currently struggling to get the rest of my science department to implement CER in 9th and 10th grade but I'm definitely going to keep chipping away! I can definitely sympathsize with how painful the experience may be currently be. I have 160 new students who have never heard of the framework and starting from scratch, after slowly building so much the previous year, is a really frustrating process. Regardless of the current frustrations, it's worth it. The teacher training cannot be emphasized enough. Even teachers who have a solid understanding of their content struggle with the details of the framework and what exactly the reasoning section looks like. Like our students, the best way for all of us to improve is consistent exposure, practice, and feedback. Hope the article helps your learning team and thank you for spreading the process. It continuously inspires me to hear about other teachers committing to practices that help our students become more scientifically literate!